Tired of the hustle of everyday life? Is its bustle also getting a bit too much? When I am and it is, I like to retreat to a little place of peace and quiet, appropriately named Ô Calme. That means ”in quiet” in French, and the name of this café is quite self-explanatory. What it’s called is what you get! Located in one of my favorite streets in Carouge, the Rue Ancienne, between le 19e and Le Bar du Nord (check both article), Ô Calme is one of the best places to get brunch in the canton. With a wide selection of teas, delicious quiches, salads and pastries, all made in an open kitchen, it is a delight for all senses. 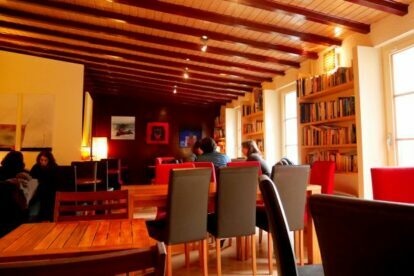 This lovely café also has a beautiful terrace for sunny days, fully stacked bookshelves and very nice staff who always seem overjoyed to be working where they do. As an added bonus for fans of wordplay like myself, the place used to be called CALM, the meaning of which was not mysterious, but it is an acronym for Comme A La Maison. Just like home. Which is how I feel there.